For the computation of the lever arm length, the acceleration of gravity at the setting up place of the calibration unit was determined experimentally by a national authority with the measurement uncertainty of 2 × 10-6. The lever arm length was adjusted to 2 × 509.838 mm because the length takes direct influence to the generated torque. To avoid temperature fluctuations on the lever arm length, the lever arm was produced with special material with a very light thermal expansion coefficient. Also the bearing friction affects the produced torque, therefore an air bearing of the lever arm was employed. The uncertainty of measurement of the 100 mass discs should be as small as possible, so the masses were adjusted to class F1. This system will be used as Reference Standard for our production. The system is located in a complete airconditioned laboratory where tem­per­ature and air humidity are regulated according to the required norms. Our existing Quality Assurance System according to DIN EN ISO 9001 has been extended by the norm DIN EN ISO/ IEC 17025, valid for calibration laboratories. 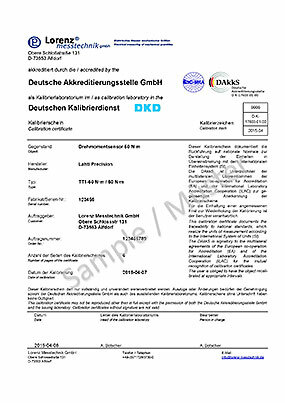 For a fast processing of your DAkkS-calibration of your torque sensor or torque sensor chain, please observe our Check List of DAkkS-Calibration Order. If you want a DAkkS-calibration of your torque sensor or torque sensor chain, please observe our check list of DAkkS-calibration order! 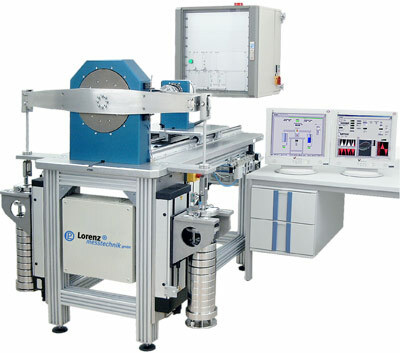 The uncertainties of measurement specified in the table are the smallest uncertainties of measurement which may be indicated on calibration certificates. The determination of these uncertainties of measurement was based on an extension factor k = 2 (corresponds to a coverage probability of approximately 95 %).